Star in the Jar is a bedtime story . . . but not really. A night sky, a star, and a goodnight wish may fill some pages, but the message is a moral thrust to do the right thing and realize the good feelings that come from doing so. My little brother and big sister team up. They inquire around school, around town, and around an imaginary fantasy world to see if someone, anyone, knows something about this special little treasure. No one claims the star and my little brother concludes therefore that it must belong to him. Not until ownership rights have been established does the star get placed inside a jar for safekeeping. It is then treated much like a firefly, a caterpillar, a funky bug pet, and carried around as a prop. Its new job is to become my little brother’s plaything and companion. My little brother is happy and contented, but not so the little star in the jar, who seems homesick, or just sick of my little brother’s home. As my little brother looks out the window at night, with the star in the jar on the ledge, he notices an advertisement written high in the dark sky. The stars have organized themselves into a constellation to spell out, “Lost, one small star.” Enter mission number two for my little brother and big sister: get the star back into the sky. At this point, big sister takes control of the situation and figures out how to let the sky know where its missing star is: right in a jar, in their backyard. Magically, the star is reunited with his night sky friends and my little brother and big sister are all warm and fuzzy from doing the right thing so successfully. 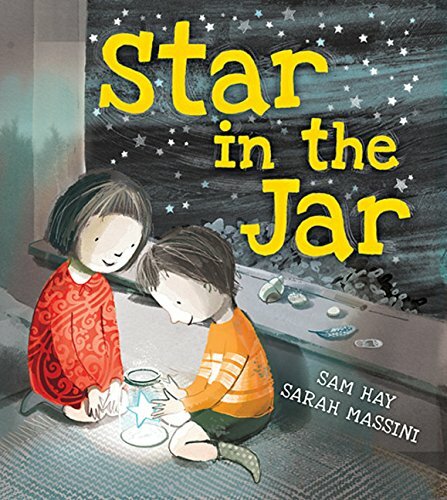 On the surface, Star in the Jar is a sweet story among the shelves of many other sweet stories. It’s easy to read, easy to follow, and the illustrations are tender and expressive. A critical eye, however, will find some aspects to the story that are not as sharp as they could be. The narration follows a simple children’s book formula: make a statement (“My little brother likes looking for treasure.”), and follow that up with examples (“Tickly treasure . . . Glittery treasure . . . even trash-can treasure.”), accompanied by the requisite illustrations. Repeat the formula again. And again. And again. Until something eventually happens to interrupt the pattern. This repetition makes the telling of the story too structured, predictable, and uninspiring. The choice of narrator is unsettling with the big sister telling the story. She is, at first, impressed with what her little brother found and the story begins with her emphatic and decisive testimony regarding my little brother’s treasure-hunter character trait. However, she quickly enters into the story, hijacks the situation, and controls the events. The story is no longer my little brother’s, but big sister’s version of what she proclaims to be her brother’s experience. Big sister is too omniscient, knowing an answer and solution to everything. The balance between her and my little brother is awkward as she even claims to know how he is thinking and feeling. She comes across as condescending and bossy. Having a third person storyteller would have solved these sticky points. Giving the characters names would have grounded the story tremendously. Instead of relying on possessive (my) and derogatory (little) adjectives, which serve to twist and misconstrue the sibling relationship, names would settle the pair in the realm of a fond sibling dynamic. The two would be clearly established as friends and confidants, beyond the typical rival power structure, which is really the intention behind the story. While the ending reads warm-hearted and mystical (if a bit cliché), with the sky constellation now forming a “Thank you, Friend” message to the brother and sister, the book feels unfinished. We are told that now my little brother will have a “forever friend who would twinkle him to sleep, every night.” A mental “aw, isn’t that nice,” will certainly come to the surface. But, wait a minute, when did having a friend to sleep near become a thing for my little brother? There was not one mention about sleeping in any of the carefully orchestrated and humorously illustrated vignettes earlier in the story. Why this sleeping outcome matters, apart from trying to force the feel of a bedtime story book, is not really clear. A final mention of how the little brother’s treasure hunting escapades resumed once the star was back in its own environment (treasures may never have been so special again? ), or a nod to how the star still played with my little brother (it joined him from afar and not from a jar?) would reconnect the reader to the my little brother playful-treasure-hunter character to offer a more satisfying conclusion. Taken at face value, Star in the Jar has some fun, clever moments. It demonstrates the resourcefulness of children and the far reaches of their imagination. The illustrations bring out the true essence of the story, which is really to be enjoyed at any time, and not just when saying goodnight.